Creating employee networks that deliver open innovation by Eoin Whelan, Salvatore Parise, Jasper de Valk & Rick Aalbers is (recently) published in MITSloan Management Review and got my attention via a Twitter message of Jasper de Valk. The leading research question for Whelan et al. is “What kinds of capabilities facilitate a company’s success at incorporating outside knowledge?” Research of Whelan et al. unfortunately shows that many companies are failing because they neglect to ensure that the outside ideas reach the people inside the firm that are best equipped to exploit those ideas. Organization Network Analysis (ONA) is used in various case-studies to research the network structures and communication patterns of the idea connector- and idea scout roles. The picture above shows an overview of the idea scout- and idea connector roles in a company’s network of employees. Idea scouts (green) are well-connected to knowledge sources (yellow) outside of the company, but the research of Whelan et al. shows that idea scouts tend to have very few strong connections inside of the company. An idea connector (orange) has an extensive network inside of the company (blue) together with knowledge to distribute technological information. In other words an idea connector needs to have an understanding of the technical innovation and should know who in the company can integrate it with the internal projects or roadmaps. An idea connector should have a basic understanding of the overall strategic direction. Idea scouts and idea connectors are two different, but very needed complementary specialist roles. A little while ago I’ve reviewed the books Open Leadership – How social technology can transform the way you lead ~ (Charlene Li, 2010) and Hoe je goed gevonden wordt – Profileer jezelf met social media ~ (Scholte & Coppes, 2012) that both describe the value of social technology for modern companies. At first you would think that only an idea scout would benefit from the use of social technology in order to easily connect to knowledge sources all over the world. But social technology is extensively used to connect with people inside of your own organization. From my own experience I see the value of Yammer, since it helps me connecting to different knowledge sources within Microsoft and driving collaboration. Idea Connectors will therefore benefit significantly from social technology as well. Summarizing: social technology can benefit both idea scouts and idea connectors. R&D leaders should consider the open innovation process in its entirety, and -for example- not focus on idea scouting only. Research has shown that breakthrough innovations tend to result from the combination of new and existing knowledge bases inside a company. Please have a look at the open innovation funnel in the article What is Open Innovation? 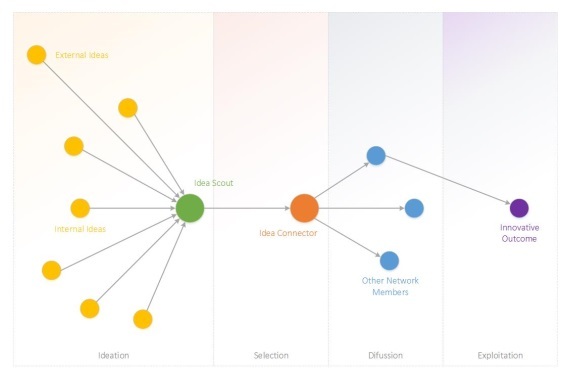 Idea scouts and idea connectors contribute most in the ideation, selection and diffusion phases of the innovation process. 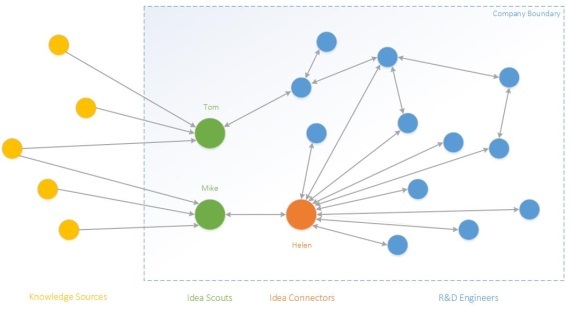 Idea scouts are critical in the earlier phases (identifying valuable ideas), where the emphasis shifts towards the idea connector in later phases. Remark that in the exploitation phase the contribution of idea scouts and idea connectors is nihil. R&D management can optimize the contribution of these innovation brokers to the innovation process, by focusing on ideation, selection and diffusion phases of the innovation process. If innovation brokers do not exist within a company, management is obliged to assign people to perform these roles. Have a strong HR perspective in place that puts the right people on these roles and not end up like many of the researched firms, where the people filling in the (informal) idea scout- and idea connector roles came as a complete surprise. Open innovation is more than importing new ideas and technologies into the organization. New ideas and technologies should reach the right people within a company, that combine them with existing internal ideas and technologies in order to mature into successful innovation outcomes. R&D management should carefully look at the innovation broker roles in their company and check the fases where these roles add the most value. If idea scouts and connectors are not present in a corporate structure, than R&D management should assign the right employees to these roles.